This is my recap of my personal experience at this race. If you’re more interested in nitty gritty details, check out my BibRave review here. Also, don’t forget to help out your fellow runners by reviewing every race you run on BibRave.com! Full disclosure here: I made a very poor choice the night before this race. We were at the ballpark so the Chess cast could sing the national anthem before the Lake Monsters game. I hadn’t had time to eat anything before we arrived and I was starving. We had carpooled with friends and couldn’t leave, so what did I do? I got nachos. You know the kind: fake liquidy orange spicy cheese, smothered with diced jalapenos and black olives and served with salsa and sour cream. I had a moment of prescience, like, “Hmm, maybe I shouldn’t eat these if I’m racing tomorrow…” *shrugs* *eats all the nachos* So yeah, bad nutrition choice there. And then the morning of, instead of my usual oatmeal or bagel, I had a bowl of cereal with almond milk. I also gulped down a glass of Nuun and then ran out the door. I arrived about 30 minutes before race start, which was plenty of time for parking, getting my bib, using the restroom a couple of times, and greeting a few friends from run club. It was a very small race, with most people having chosen the 5k option, so I was not-so-secretly hoping I might squeak by with an Age Group award. I lined up towards the back of the pack, and with a surprisingly loud blast from the starting gun, we were off. For miles 1 and 2, I was working really hard to keep a slow, easy pace. I didn’t want to go out too fast and not have anything left for the end. I knew this race had a lot of rolling hills on the trail portion. Only about 1.2 miles of this race were on the road, and the rest were on the Ti-Haul Trail and the Shelburne Bay Rec Path, which is mostly shaded, and very pleasant, aside from the hills. From mile 2.5ish to the turnaround at the water station/halfway point, I started to feel really rough. I was hot, sweaty, and thirsty. I also was starting to feel like maybe I hadn’t eaten enough. I stopped at the water station and had a cup of water and a cup of electrolytes to try to get something in my system. I continued running, but slowed down significantly in the last few miles. At first, my mantra was “You’re almost done. It’s a beautiful day. You’re not last.” I repeated that over and over until mile 5, when it became: “Just finish. And don’t puke.” Eventually, I finally made it, and when I was in sight of the finish line, I picked it up for a fast finish. My friend Alan from run club was right there cheering for me, and I saw my friend Janet too (she had run the 5k). Immediately after I finished, I felt like I might puke, but didn’t. I got a bottle of water and just walked laps around the finishing area until my heart rate came down. There was a massage station and a stretching station run by a chiropractic office, so I took advantage of both of those. The chiro thinks I have an imbalance in my right hip, which I think is true based on my own observations, so that may require some attention in the future. After stretching and massage, it was time for awards. Since there were only two females in my age group, and the other female was the first female overall for the 10k, I ended up winning my age group by default. Woo! 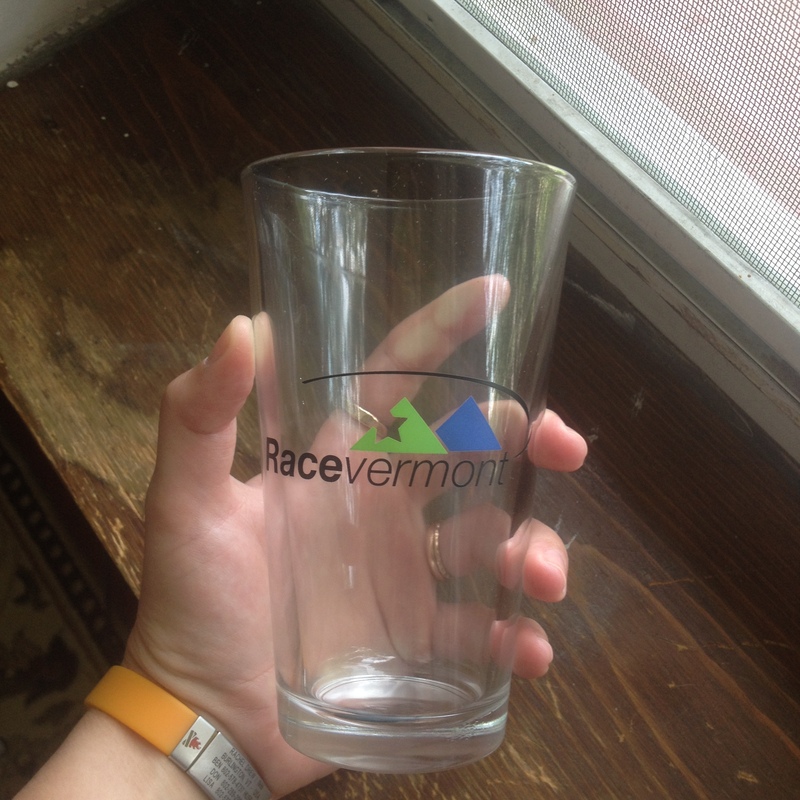 I got a snazzy pint glass with the RaceVermont logo on it. I also won a free chiro evaluation from the raffle, which means that I can actually go get my hip checked out for free. Sweet! I’m still processing this race, because it definitely didn’t go the way I’d hoped it would. I’ll probably do a deconstruction post later this week to try and figure out what happened. One thing I know for sure was a bad idea: jalapenos in copious amounts. Have you ever totally sabotaged yourself before a race with poor nutrition? Nice work! 🙂 Bummer about the nachos (been there! ), but you did it. I’ve never run a race that’s partially on trail, but sounds like it could be fun. It’s a really nice trail–no big tree roots or anything to trip on! Thanks, Charissa! At least I learned my lesson. Yes unfortunately. But usually I try to be good. Congrats on the AG award. Don’t beat yourself up. There will be more races. At least I know what I did wrong, and yes, there are always more races! I’m usually pretty careful about what I eat before a race but man, I would’ve struggled too with this nachos. I LOVE NACHOS. I totally know your pain. I ran the Cherry Blossom 10 Miler a few years ago and had Mexican the night before. OMG. It. Was. AWFUL.I know it didn’t go your way but I think you did a good job of trying to pace yourself! And, you didn’t puke 🙂 Congrats on the race!!! Not puking is always a win! Sorry it was rough! I’ve been there with the poor food choices pre-race. Now I eat hardly anything. Nice AG award! Thank you! Definitely need to make better choices next time.